I did not see much of the other games on Thursday, but Ray lost to Roy Lathwood, the current Minor Champion. John drew with Howard Phillips. I am not sure how Graham B did as he was sitting on the row of tables behind me. There was a surprise after about fifteen minutes when David Reynolds (with the black pieces) announced check mate against a very startled Bob Collins - a smothered mate in nine moves. It seems that this was the Keininger Trap in the Budapest Gambit. 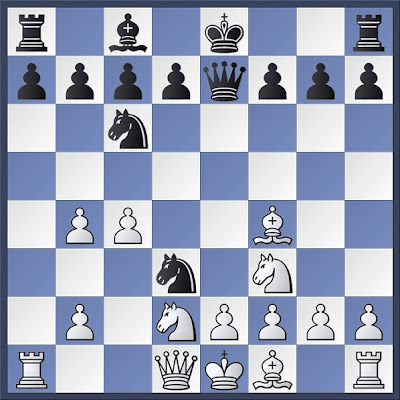 6.Nbd2 Qe7 7.a3 Ngxe5! 8.axb4?? 8...Nd3#! Club night on Tuesday at the Arms. HA1 may, or may not, be playing their first Wylie Cup fixture at Loughborough. (Hello and Welcome to the Blaby District Chess Club website). A runaway success for HA1. A very respectable place in Division 3 for HA2 who were promoted at the end of last season. HA3 lies stuck like a postage stamp to the bottom of Division 5. A look at our web traffic indicates a lot of current interest in our little Chess site from Russia. When i checked last night, in the previous week, there had been 121 pageviews from Russia compared with 114 from the United Kingdom. United Kingdon 105, Russia 86, USA 32, Rest of the World 11 (n=234). I suspect that Raymondov has a following. Haka Dave has a draw by default. Last Round of the Major. Loughborough started with a half point handicap bonus. Mike C took some risks and lost. Graham B went a Rook for a Pawn up and then blundered back the rook - then agreeing a draw. Graham S drew; and Pete pulled a win out of the bag from what had been a worse position. The handicap was enough to decide the match in Loughborough's favour. Braunstone won the Major League Cup (and also won the Minor this year, too). The dining room was booked out this week, so we had club night in the alley where we had to be fairly quiet because of the match, but we had some friendlies and another book swap. On Tuesday, 24th April, there will be a fairly select club night - we have another new player coming down. Thursday 26th sees the first round of the lower sections of the County Championship at Wigston. Tuesday saw another smallish club night at the Arms. I brought some books down and we played a few friendlies. I know that other people were considering entering - the deadline is this Friday - 13th April. e-mail sean@lrca.org.uk if interested - he will be glad to hear from you. We have entered one side (HA1) into the Wylie Cup, one side into the Harrod Cup (HA2/3) and one side into the Chapman Cup (HA2/3). This should allow plenty of time for County Championship Games, the Summer Cups, and a Club Championship. On Tuesday, 17th April, HA1 play in the last round of the Major League Cup. They have a good chance of winning this. Also on Tuesday, we will be doing some coaching. Last Thursday, HA2 drew their last match at Market Harborough to finish the season in the middle of Division 3. On Tuesday we had a fairly exclusive club night - just the die hards and Drew the Younger. We are now definitely banned from having any direct access to the skittle alley key as we have taken it home with us three times within the last month or so. No matches are organised for next week, but there will be a club night on Tuesday 10th April. Anyone and everyone welcome.